OSWEGO – The Oswego Health Board of Directors is pleased to announce Michael Harlovic as the health system’s new president and CEO. Harlovic was approved unanimously by the members of the Oswego Health board at its April 24 meeting and will officially begin working at Oswego Health on July 3. Harlovic arrives at Oswego Health with more than 31 years of healthcare experience, having started his career as a registered nurse and steadily advancing through the years to the position of president and CEO of Allegheny General Hospital, located in Pittsburgh. Allegheny General Hospital is one of eight hospitals located in western and Pennsylvania and New York that are a part of the Highmark Health, a vertical integrated diverse health services company, offering insurance and other health-related services to individuals in 50 states. While serving as president and CEO at Allegheny General, Harlovic developed successful patient experience initiatives, oversaw some $2.3 billion in gross revenues and developed innovative programs that recruited and retained physicians and staff. 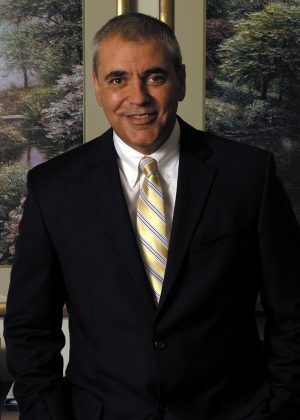 Most of Harlovic’s healthcare career was spent at Allegheny Valley Hospital, part of the same healthcare network, which serves the northern and eastern suburbs of Pittsburgh. Harlovic compared this 200-bed facility where he worked for 21 years to Oswego Health. He added that he found that those he met during his three-day interview process were connected to one another. “From the moment I met the members of the search committee, the board and the employees, I knew I was hooked, as everyone was professional, engaging and fun. It was also important to me to find everyone not only engaged with one another, but also with the community as well,” he said. Harlovic was initially hired at Allegheny Valley Hospital as the psychiatric program manager. He soon advanced to director of nursing service and then to vice president of patient care service, before being named senior vice president/chief operating officer. In 2012, he was appointed present and chief operating officer. Under his leadership, Allegheny Valley Hospital improved its operating margin, expanded its multi-specialty outpatient practices and achieved the network’s #1 ranking for service and patient experience. Allegheny Valley Hospital also earned several awards from Healthgrades, the leading online resource for comprehensive information about physicians and hospitals. The facility was presented the Distinction in Clinical Excellence Award for five years, leading to the hospital being named as one of Healthgrades Top 50 community hospitals. Board President Gagas said the new president and CEO has the leadership and skills needed to assist Oswego Health as it continues its transition into a system-management style. Harlovic earned both his Bachelor and Masters of Science in Nursing degrees from the University of Pittsburgh. He holds a professional certificate in executive leadership from The Wharton School, located in Philadelphia. He has also held faculty positions at Pennsylvania State University’s New Kensington campus and at Butler Community College. Harlovic and his wife, Cornelia, will relocate to the area in the near future. The couple has two grown sons. In his spare time, Harlovic enjoys hiking and fishing.